One great aspect of shooting video is the correlation between Aperture and ISO. They can easily be adjusted in equal increments so that they can help compensate for the other when you're trying to set exposure. The exposure triangle shows how the three main settings on a camera, aperture, shutter speed and ISO, affect exposure. In the still photography world they have this exposure triangle they use to show these associations that includes shutter speed but in the video world we really don't change our shutter speed. It’s fixed. Except when we have to, when we shoot slow motion or green screen. So I guess we do need to know how to compensate for it. It’s also helpful to understand not only how they work together to get you a proper exposure but also how they create important visual elements of your shot. Aperture, how much light you let in through your lens. A cool looking, mechanical ring controls the aperture size. A wider aperture, obviously lets more light through and also creates a smaller depth of field because the light is less collimated. Once you get down to f/4 and especially lower, you get a shallow depth of field look and even bokeh. Shallow depth of field shot at an f/2. A smaller, tighter aperture on the other hand, lets in less light and gives you a wider depth of field. At certain f stops, especially f/16 and higher, you can get almost everything in focus. The smallest f stop is a pinhole camera, infinite focus. The common stop increments are 1.4 2 2.8 4 5.6 8 11 16 22 and most lens have 1/3 increments in-between, some 1/2. Shutter speed, the amount of time that light coming through the lens is allowed onto your sensor per second. Shutters in film cameras are mechanical, rotating discs but in our digital video camera’s we have an electronic shutter, which is the sensor being told to record a frame at a certain intervals. For video, we normally fix our shutter speed based on what frames per second (FPS) we’re shooting at. We double the FPS to get us an approximate shutter speed 1/60th of a second at 30 fps, 1/50th of a second at 24 fps. This rule of thumb gives us what’s considered normal motion blur. Shooting at a shutter speed slower then your fps creates a dreamlike motion blur effect. Created on a Canon 5D mk III using Magic Lantern. But if your camera could shoot slower shutter speeds you could create a dreamlike effect with lots of motion blur. It also lets in more light so you would need to compensate for it. Now a faster shutter means less motion blur, crisper edges on moving objects and people. DP Janusz Kaminski used this effect in action scenes on Saving Private Ryan, using shutter speeds 2 and 4 times faster than normal for a hyper-realistic effect. In video, if we’re shooting slow motion, we’re increasing our FPS and therefore our shutter speed to maintain that roughly double number. 60 fps - 1/125th, 120 fps, 1/250th. Also, if we’re shooting green-screen, it’s generally a good idea to increase your shutter speed to get crisper edges and therefore pull a better green screen plate. So at 30 fps, we shoot at the higher shutter speed of 1/125th. ISO, the sensitivity of your sensor light. The lower the ISO, the more light required for an exposure and the less visual noise, therefore a better quality image (but there are important exceptions we’ll cover). The higher the ISO, the less light required but you gain more image noise. 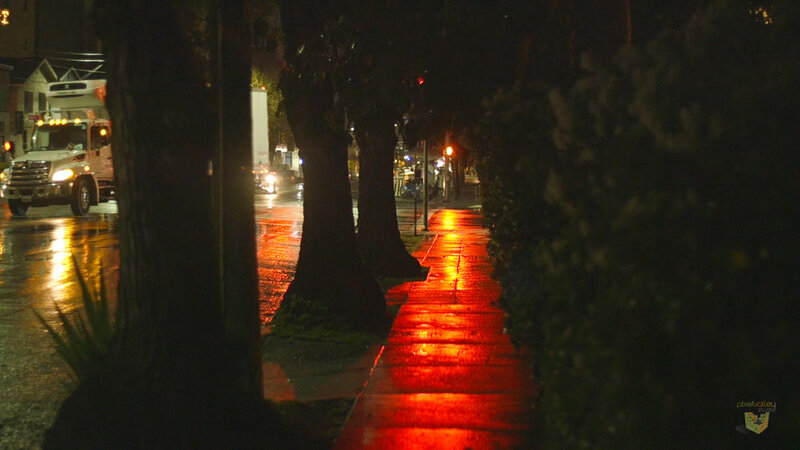 Viewers are familiar with the the grainy, high ISO look of night shoots. As viewers, we’ve become accustomed to the look of grainy night time scenes because of high-speed film stocks used in the past. This may change because of the super sensitivity of newer sensors and maybe create a whole new aesthetic. ISO numbers double in value for each stop of light change. Common ISO settings in 1-stop increments. These attributes work in 1 stop increments and fractions of them, usually 1/3 of a stop, which makes our lives a little easy. ISO and film speed double or half for each full stop, it’s just f stops that you have to memorize or keep a cheat sheet of them. And since our shutter speed is generally fixed, we’re just moving ISO and Aperture up and down when needed. If my exposure is at a f/5.6, ISO 200 on a DSLR and I want to open up to an f/4 for a softer focus background, that’s an extra stop of light I’m gaining. I need to lower my ISO down from 200 to 100 to take away one stop to compensate. But there’s some other tricks and tools we can use in addition to those three. I’m shooting inside using a zoom lens that only opens to f/4, which is common. You generally pay a premium for a lens that opens more than that, especially a zoom. I need an extra stop of light for a proper exposure, so I could increase my ISO by one stop. Say 200 to 400. Simple. But if I don’t want that extra noise or if I need more then one stop, then there’s another option not on this triangle. Adding more light. Lights are not on the triangle because it only deals with those three common factors integral to any still or video camera. But light is part of the equation. If I have a 4’ 2 bank fluorescent, I could add another one, doubling my light output on my key, that’s one stop right there. I will need to do the increase my fill and ambient light as well to maintain the same contrast ratio. I could move my lights closer if my framing allows it. If you cut the distance between your subject and the light by half, you’ve just doubled your light output, that’s one additional stop just by moving your light. What if I’m outside and I want to shoot at an f/2 for that soft out of focus background but it’s a bright, sunny day and I’m getting an f/16. That’s a 6 stop difference. Earlier I mentioned an exception to gaining a better quality image when lowering your ISO. In film, that was the case because the grain was super fine the lower the film speed. But in our world of digital sensors, it’s not always the case. All sensors have what is called a “native” ISO, were they record optimally. A lot of DSLR’s are around 160 or 200 so lowering to 100 no big deal. But the C100, at a native 850, loses details in the whites if lowered too much. Not desirable. So I rarely ever lower it below it’s native ISO. Front of the lenses ND filters allow you to shoot with your lens wide open on a sunny day. ND’s to the rescue. Neutral Density filters are either screwed onto the front of your lens or are built into the camera, behind the lens. They absorb light in one stop increments, 1, 2, 3 and up and can be ganged together if needed. With a DSLR at 200 ISO, I would only need to lose 4 stops in order to open up to an f/2 but with my C100, at that 850 ISO, 6 stops. Luckily, its built-in ND’s go that far. So that’s the exposure triangle with some added extra’s. If this is all new to you, don’t fret if you’re not getting it all. It can take time and practice with your gear but you’ll get it over time. What may trip you up are the 1/3 increments. But don’t sweat a third or a half a stop here or there. With video, you can see what you’re getting and if you like it, you’re good.